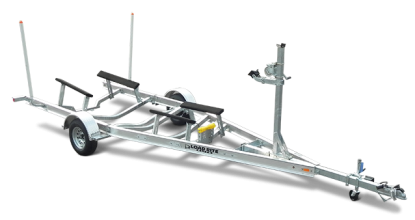 Load Rite galvanized catamaran trailers provide exceptional durability and performance for the long haul with heavy-duty galvanized steel construction and advanced frame designs. All models feature our patented tubular frame design, which protects brake lines and wiring and conceals U-bolts for a streamlined look. Our bunk system provides exceptional security and support and easy loading and unloading. Standard features include galvanized steel frame, torsion axles, bead-balanced radial tires (13″ diameter and above), LED lights, and Quick-Slide® bunk covers. A generous option list let you customize a trailer to suit your boat and your budget. 16’7” Hobie Getaway with wing seats on 1680076C.